Congratulations, Shirley,You've received a badge! Certified Community Management Specialists are uniquely qualified to help brands and businesses create, grow, and maintain thriving online communities that drive business value - providing a powerful tool to build leads, sales, and loyalty. They are trained to properly apply communities into the marketing mix that benefits both brands and community members, transform traditionally transactional customer relationships into strong emotional bonds, and keep the community environment safe through proactive and reactive moderation strategies. 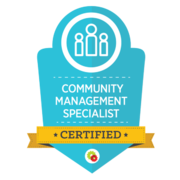 Recipients of the "Certified Community Management Specialists" designation must complete an advanced, 7 module, 58 lesson online course and pass 7 quizzes and a final exam that tests on the full spectrum of building a thriving community and how to tie it to business needs and goals. When combined with the education, this final exam ensures the public that the recipient has attained a level of competence appropriate for professional practice. Declining a badge is irreversible. You may mark a badge as Private without declining it.